BANGI, 25 Aug 2014 – Tourism at Langkawi declared a UNESCO Geopark should be carefully regulated so that the mass influx of visitors and tourists there would not destroy its pristine environment. An organisation concerned with preservation of the geopark status, The Friends Of Langkawi Geopark (FLAG) is raising awareness about the vulnerability of the islands’ environment. 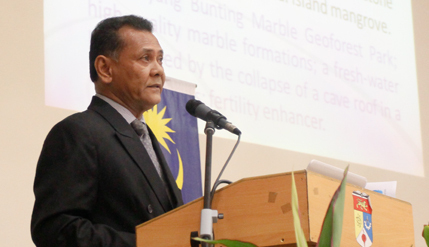 Visiting scholar of The National University of Malaysia’s (UKM) Institute For Environment and Development (LESTARI) Dato’ (Dr) Kamarulzaman Abdul Ghani said the institute is doing all it can to retain Langkawi’s geopark status while developing it into one of the world’s most important tourism destinations. He was delivering a public lecture on The Making Of Langkawi Geopark: An Experiential Journey organised by LESTARI here today. LESTARI together with the Langkawi Development Authority (LADA) are trying to rally stakeholders and the local residents to raise consciousness of Langkawi geopark’s status which was awarded in 2007 by The United Nations Organisation for Education, Science and Culture (UNESCO). Having won the Geopark status, Langkawi is struggling to hold on to it, as the negative effects of tourism take their toll on the archipelago’s beauty. The Killim Geoforest park is one of Langkawi’s most popular attractions, along with Gunung Machinchang with its cable car rides and sky-bridge. “The awareness of Langkawi Geopark is not clear to many people, including the stakeholders. We need to convince UNESCO that we can maintain the status so that the local economy would thrive even more,” he said. There had been reports that the authorities had not taken action on visitors who took away geological samples from Langkawi’s rocks – the oldest in South-east Asia. The island’s geology was formed more than half a billion years ago, well before the peaks of Mount Everest and the Himalayas rose to their current stature. The Langkawi islands also have unique ecology, typical of islands separated from their mainlands by substantial bodies of water. Dato’ Kamarulzaman said Gunung Machinchang, one of the peaks on Langkawi Island, was the first part of Southeast Asia to rise from the seabed during the Cambrian period 540 million years ago. The dense rainforest that cling to the sides of the mountain has been growing and evolving for millions of years. Langkawi earned the UNESCO geopark status in 2007, the first in Southeast Asia, thus highlighting the island’s important geology and contributions to knowledge of the Earth. The listing encompasses the whole of Langkawi with the attractions divided into three areas: the Machinchang Cambrian, Kilim Karst and Dayang Bunting Marble geoforest parks. Like most Unesco recognitions which include “world heritage” and “geopark”, the listing has helped position its holder as a premium tourist destination. Thus Langkawi has since then been experiencing an escalating number of tourist arrivals injecting much needed revenue into the local community. Among those who attended the lecture were LESTARI Director Prof Dr Mohd Raihan Tahar and his Deputy Prof Dr Che Aziz Ali, directors of Institutes and Centres of UKM.